Irish rugby internationals Ian Madigan and Dominic Ryan will be well-known faces in the Leopardstown parade ring before one of the most lucrative handicaps of the season as the pair, along with Paul Byrne, own longtime ante-post favourite The Crafty Butcher. It must have been an anxious couple of days for the trio as The Crafty Butcher needed a dozen to come out of the race after the five-day forfeit stage, but their prayers were answered as he sneaked in. The fact Ruby Walsh hopes to get down to 10st 1lb to ride (although he may put up 2lb overweight) tells you all you need to know about expectations for the ex-Michael Hourigan-trained nine-year-old. 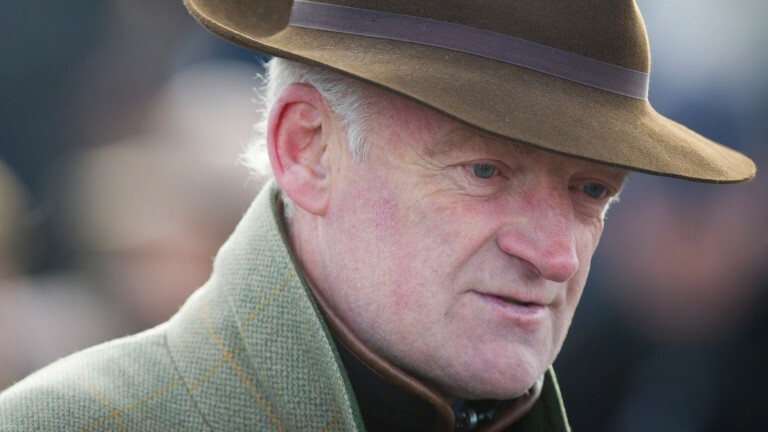 The Crafty Butcher is one of four runners for champion trainer Willie Mullins, who last won the race in 2013 with Rockyaboya. Tennis Cap, Rolly Baby and Sabremont complete his quartet. This juicy prize could play a big part in the Irish trainers' title and pacesetter Gordon Elliott runs six, spearheaded by last season's Grand National sixth Ucello Conti, the mount of Daryl Jacob. Davy Russell will be on board Noble Endeavor, who was fourth in the Troytown, while last season's Kim Muir winner Cause Of Causes is one of the JP McManus team. Although this race always attracts a maximum field and is one of the hottest handicaps of the season, four of the last five winners have been sent off at 7-1 or shorter and Colbert Station justified 5-1 favouritism in 2012. I was thrilled to bits with Ucello Conti at Aintree on his return this month. He loves it there and put in a great round of jumping. This has been the aim since and then it will be getting him back to Aintree for the Grand National. I still think Noble Endeavor would have gone close in the four-miler at Cheltenham had he not come down at the second-last. He was sent off favourite for the Troytown and ran a lovely race in fourth. This has been the plan since and he's in great form. They'd probably be the pick of my bunch. Cause Of Causes is a real stable favourite and should run well, and similar comments apply to Bless The Wings, who almost won the Irish Grand National. Shadow Catcher and Captain Von Trappe are both well and won't be disgraced. I'd have preferred much softer ground for both. Bonny Kate would certainly like more cut. She's done us proud in some big handicaps and I'd love to see her winning one. She's in great form. Killer Miller would also like it softer. He came back from a long layoff in the Troytown. He's been in good form since. It's one hell of a hot handicap but he ran well to take second in the Munster National at Limerick and that's solid form. He's in good form, won't mind the ground too much and should go well. He's a nice horse. They're both in good form and I'd like to think they both have decent chances. Barry Geraghty went for Rogue Trader and he seems in good form on the back of his win at Punchestown. I'm not too concerned about the trip for him and it would be more of a worry for People's Park, who is stepping up markedly in distance. I'm hopeful he'll get it and he's bred to do so. The ground will suit Rogue Angel but he faces a tough enough task. Dromnea has some cracking runs to his name this year. The ground will suit him and everything seems to be in his favour. Folsom Blue would love a bit of rain but has only got 10st 4lb and Bryan Cooper has picked him so I think he could go really well. Thunder And Roses ran nicely last time at Fairyhouse and seems in good form.